Hunt Building Corp. will pay the state about $100 million for 298 acres at Kapolei as part of a public-private partnership to build the long-delayed permanent campus of the University of Hawaii-West Oahu, the university announced yesterday. The university hopes the current session of the Legislature will provide an additional $35 million, making a total of $135 million that the university will use to complete a first phase of the new campus. That work would be done on 202 acres adjoining the Hunt purchase. The 500-acre tract from which the two areas are being carved originally belonged to the Campbell Estate, which donated it to the state. West Oahu Chancellor Gene Awakuni said the first phase will consist of four buildings: classrooms and administration, library, student services and power plant. The floor space will total 215,000 square feet. For 31 years, West Oahu has survived in wooden portable buildings at Leeward Community College. It consists of only the junior and senior years of a four-year program, with students taking their first two years in community colleges. That arrangement has become nearly unworkable. As the West Oahu school adds freshman and sophomore classes this fall, it must have more space. University regents approved a temporary solution yesterday, renting additional space in Kapolei owned by Island Pacific Academy, the James Campbell Co. LLC and the University of Phoenix. The overall cost will be $197,000 per year. Even though those facilities will be considered a satellite of the Leeward operations site, they will "ramp up the necessary student mass" at Kapolei for a permanent campus there, a university document said. Awakuni said 16 months will be needed for construction, which should be done in time for academic use in August 2009. Hunt will develop infrastructure for both areas and build residential and commercial projects in its area. The company has been building residential and other projects at Pearl Harbor for several years. 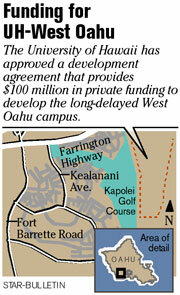 When regents approved a long-range plan for West Oahu in 2004, the intent was to sell only 169 acres, but university costs have reached $135 million now from a maximum of $88 million then.